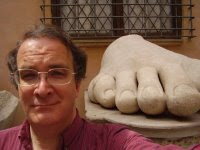 Scott D. Parker is a writer looking to break into SF&F and eager to catch up on recent "must reads" of 21st century science fiction and fantasy. He asked me for a list of books/authors that everyone should read, and I gave him permission to post my response to his blog, SF Safari. Here, then, is my SF/F Reading List for the 2000s. This isn't meant to be comprehensive by any means. It was intended just to get him started, and I compiled it with an eye towards complimenting the many Pyr books he has already purchased. Note that it is not a Pyr-only list at all, though there is no one looking for cutting edge SF that would be hurt by reading McDonald or Kenyon. My interview with Matthew Sturges is up at Tor.com. Matt is the author of Midwinter, as well as the comic books House of Mystery, Shadowpact, Salvation Run, Countdown to Mystery, Blue Beetle, Jack of Fables (co-written with Bill Willingham), and the forthcoming Final Crisis Aftermath: RUN! The Locus Awards Finalists have been announced and I'm thrilled to report that two stories from Fast Forward 2 are in the running. Congratulations to all three authors and thanks for such terrific work. Winners will be announced at the Locus Awards Ceremony in Seattle WA during the Science Fiction Awards Weekend, June 26-27, 2009. Issue 5 of the Concept Sci-Fi ezine is out, and it includes an interview with Yours Truly talking (mostly and frankly) about the submission/seeking a publisher process, but also about the past (my background) and the future (forthcoming Pyr releases). The issue also includes short fiction from Dylan Fox, Lawrence Buentello and Jonathan Lowe, and other nonfic features. You can download a PDF here and a mobipocket format ebook here. I encourage you to do so, natch. Because I've been talking with George Mann all week about the roots of pulps, gaslit alleys, steampunk, Sexton Blake, masked avengers, and all that goodness. And because The Mountain Goats rock my world. "Sax Rohmer #1" is from Heretic Pride. The album also features "Lovecraft in Brooklyn" and "How to Embrace a Swamp Creature." How can you not rush out and download it? 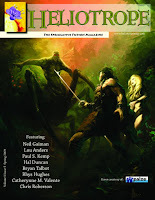 Issue # 5 of Helioptrope is out. It's available online and as a downloadable PDF, and is entirely devoted to the genius of Michael Moorcock. It opens with Neil Gaiman's "One Life, Furnished in Early Moorcock," and then a piece from Yours Truly, "Michael Moorcock: Behold the Man," wherein I talk about Mike's collosal influence on sf&f, "serious" literature, rock and roll, RPG and computer gaming, and quantum physics. Fortunately, Bryan Talbot is onhand to address my one serious omission. He discusses Mike's colosal influence on comic books in "The Moorcock Effect." Chris Roberson talks about his personal interactions with Mike the person in "Moorcock the Author, Mike the Man." Also included are appreciates by Paul S Kemp, Hal Duncan, and Catherynne M. Valente, and Rhys Hughes. There's a lot of Mike love in the issue, but that's something there can never be enough of. The latest in my graphic novel reviews is up at Tor.com. This time, I'm taking a look back at Jeff Loeb and Jim Lee's Batman: Hush, in preparation for reading Paul Dini and Dustin Nguyen's Heart of Hush next. I bought Hush when it came out in hardcover initially, but got distracted and only finished it now, some seven years or so later. But I don't think I was in the mood for it at the time, because I really intersected with it well now. Check out the whole review. But my short summation: damn good! This isn't gonna fit on my blog, but you can full screen it or follow it back home to see it all. Very sad, if not entirely unexpected news. Space Diving: Sport of the Future! Thanks to Joel Shepherd for pointing this out. And from Armadillo Aerospace. The genesis of Morlock was, I think, frustration with two of my favorite writers, Tolkien and H.G. Wells. I was annoyed that Tolkien so obviously favored elves over dwarves, and that Wells did the same with Eloi over Morlocks. Morlocks did stuff—they worked and learned and thought and created. They seemed to me more authentically human than the empty, shiny Eloi. So what if they lived underground and weren't so pretty? The cannibalism is a little harder to stomach, as it were—but I'm sure that's exactly why Wells put it in. That's his thumb on the scale, trying to tilt our judgment of his characters. Then over at The Agony Column, Rick Kleffel and I talk about Steampunk, Victoriana and Elizabethan SF, with a bit about Chris Roberson, George Mann, and old series Doctor Who. Here's a direct link. Meanwhile in response to my accidentally traumatizing her with an offhand statement, Justina Robson asks What is Fantasy About? Please go join in the discussion. I sense brilliance on the verge of conception. 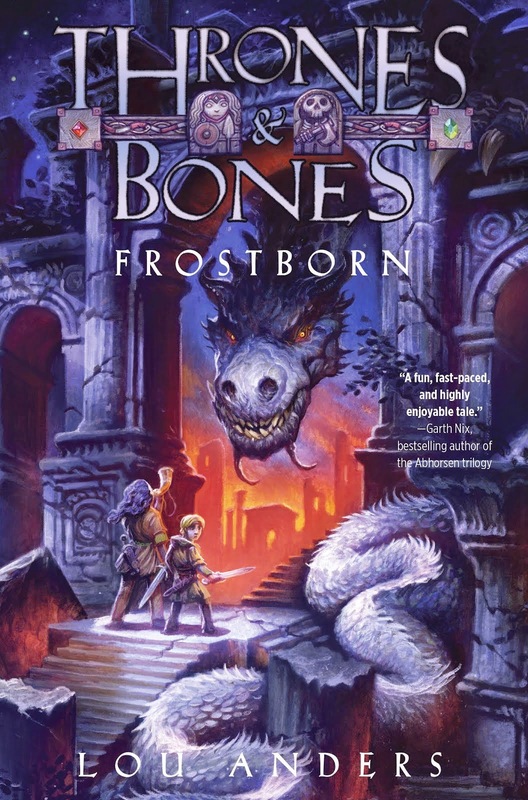 ...a book that any fantasy fan will get a lot out of. 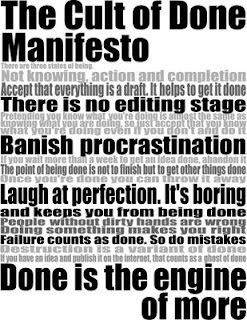 ...there is no denying the sense of urgency that leaps out off the page and drives the story along [at] a very fast pace. The constant plotting and scheming underneath the surface adds to this urgency as well as giving the reader the best possible reason to keep reading. There are loads of questions that all need answering and it’s all credit to Sturges that these are the kind of questions where you care enough about the answers to invest more time in reading the book. You also cannot deny the dangers that our travellers must face on their journey and these make for some great moments where anything could happen and spectacle is the order of the day! Hey, I'd be rushing out to get that now if I hadn't read it already. But if you need more convincing, Jessica Strider at Sci-Fan Letter interviews Matthew Sturges, about the book and the craft of writing in general. I was doing a presentation about writing comic books for a group of fourth-graders, since I'm most known as a comic book writer. Most of the questions were what you'd expect from nine-year-olds: Who'd win in a fight between the Hulk and Superman, that kind of stuff. Just as the questions were dying down, a kid in the back raised his hand and asked, "How much do you make?" I paused for a second and said, "I do okay, I guess." He wasn't satisfied, "Can you give me a dollar amount?" "That's an inappropriate question," said the teacher, embarassed. "Why?" said the kid. "How can I tell if I want to do that job if I don't know what it pays?" ...one heck of a wild ride, with action, excitement, danger, violence and epic confrontations occurring left and right... I’m not certain I would say The Twilight Herald is an improvement over The Stormcaller but Lloyd at the least reveals an impressive level of verstatility in terms of style between the two novels. Furthermore he maintains an ability to include a subtle over-arching theme of revenge across the entirety of the novel that is never overwrought or glaring. Lloyd is keeping me guessing with the series and, criticisms asside, that is something I can definatley appreciate. And that's enough news for one morning, right? Update: Well, no, because there's a terrific interview with Tom Lloyd that is up at Fantasy Book News & Reviews. My friend and fellow PKD nominee Jeff Carlson, author of the excellent Plague Year and Plague War, kindly read an excerpt from Fast Forward 2 at the ceremony on my behalf. He sends these photos, one of him posing with the FF2 book cover, and the other with winner David Walton (who split the honor with Adam-Troy Castro). And here is Jeff's brief but worthwhile con report. Please somebody go explain Twitter to him and why he needs it. I've done my bit. Robert Thompson, of Fantasy Book Critic, on James Enge's Blood of Ambrose. 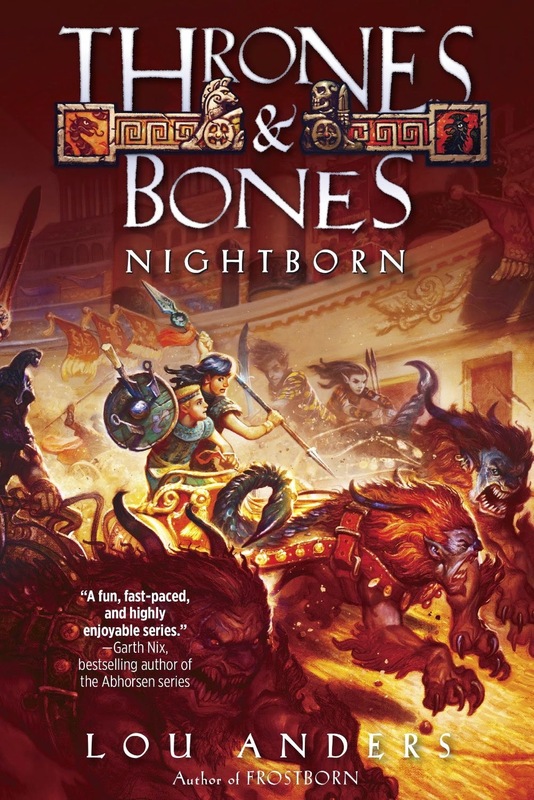 This is the second comparison to Joe Abercrombie in as many reviews, which is heartening to me, as it's a similarity that I found very strong when I was initially reading the manuscript and thinking about acquiring it for Pyr. "Combining elements of sword & sorcery, pulp fiction, the Arthurian legend, humor and horror, James Enges’ debut novel, Blood of Ambrose, is like a cross between Robert E. Howard, Joe Abercombie, and Monty Python and the Holy Grail with a dash of H.P. Lovecraft and Sam Raimi’s Evil Dead sprinkled in... For fantasy lovers, there are plenty of familiar elements... but because of the humor, the cynicism, the trickery and the horror elements, the familiar quickly becomes unfamiliar. 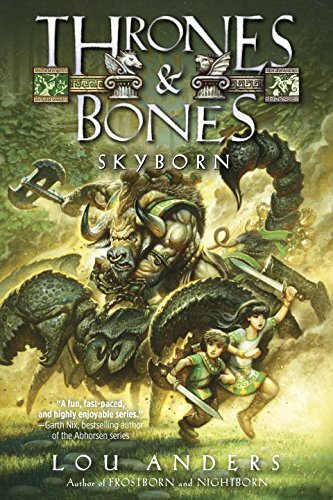 ...skillfully written and a very fun, imaginative and unique reading experience. 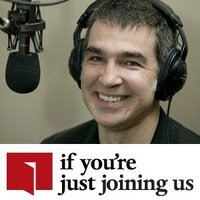 In short, I had a blast with Blood of Ambrose and can’t wait for more..."
Jon Armstrong has uploaded the latest podcast in his marvelous show, if you're just joining us. 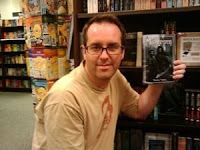 This one is an interview with Blood of Ambrose author, James Enge. Jon says, "James and I talked about his pseudonym, sci-fi and fantasy, writing, unicorns, and talking squids." There is a direct link here, and the podcast is available via iTunes. 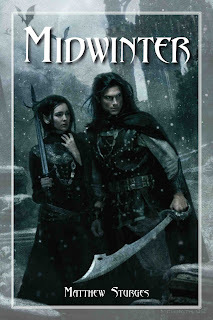 Matthew Sturges, author of the fantasy novel Midwinter, will be signing at the Barnes and Noble in Round Rock, on Saturday April 18, 2009 at 2:00 PM. The store is located at La Frontera Village, 2701 Parker Road Bldg A Suite 700, Round Rock, TX 78681, telephone number 512-600-0088. Here's a link to the event on the B&N website. It's just sick how close to the rocks and the ground they get, isn't it? Yes, Yes, Yes! The most ambitious epic science fiction series of the current decade! Kay Kenyon's epic series, The Entire and the Rose, grows stronger with each new volume. This may well be the most ambitious epic science fiction series of the current decade. While clearly science fiction, the atmosphere and feel of the series has many of the qualities of fantasy and can be enjoyed by readers of that genre who do not like much science fiction.... If you are not already reading this series and you are at all interested in current science fiction, you really should be. Start with the first book, Bright of the Sky. (Ignore the way it seems to jump in the middle as if there was an earlier volume, Kenyon chose to put much of the early history in as flashbacks and information revealed to an amnesiac hero.) There is one book left of this four-book series, Prince of Storms which will come out January 2010. I am really looking forward to seeing how Kenyon is able to resolve everything. Very highly recommended. About elves... I love Tolkien’s work, but I think the elves of The Hobbit and Lord of the Rings are the weakest parts of his world-building. He too obviously has his thumb on the scale. Everyone is beautiful and sings and loves learning? All the children are above average? The elves of the First Age are more plausible because they’re more fallible. But I couldn’t see introducing elves into Morlock’s world without giving them more realism: showing the ugly elf, the ill-tempered lazy elf, the tone-deaf elf. At that point it becomes less like sword-and-sorcery and more like Bored of the Rings. Quotes like these have to be shared.